Applying the keyhole principle (discussed in section “Intracranial Aneurysms: Keyhole Transcranial Approaches”), the vast majority of unruptured and ruptured aneurysms can be successfully treated using limited keyhole craniotomies. Suitable keyhole craniotomies for aneurysm surgery are the supraorbital, mini-pterional, interhemispheric, subtemporal, retrosigmoid and median suboccipital keyhole approaches. The most frequently used keyhole craniotomy for aneurysms is the supraorbital keyhole approach (SOKA). 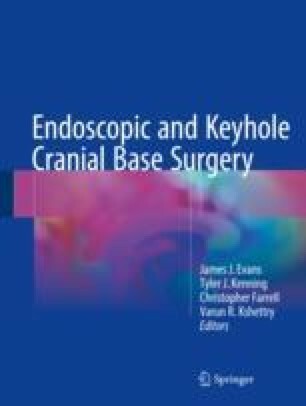 The most important limitations of keyhole craniotomies are: (1) limited ability to change the surgical trajectory during the operation, (2) restricted maneuverability of instruments and (3) impaired visualization based on the limited opening. Thus, meticulous preoperative planning and the use of endoscopes as well as specific keyhole instruments are mandatory. Good outcomes could be achieved in 96.5% of patients with unruptured aneurysms treated through keyhole craniotomies with an endoscopic-assisted technique. The endoscope provided important visual information that led to clip repositioning in 19.1% of cases. Cosmetic results in patients treated via a SOKA were rated very satisfactory by 84% or satisfactory by 8.8% and no or only little postoperative discomfort was reported by 89.3% of the patients. Permanent morbidity was frontal hypesthesia in 3.4%, hyposmia in 2.1% and palsy of the frontalis muscle in 2.1% in this group. In general, a trend for fewer complications was associated with surgical treatment of aneurysms using keyhole craniotomies. Endoscopic endonasal approaches (EEA) for the clipping of intracranial aneurysms (discussed in section “Intracranial Aneurysms: Endoscopic Endonasal Approaches”) is a relatively new but controversial topic in cerebrovascular surgery. In recent years, various authors have reported successful results utilizing the EEA to treat vascular lesions for specific, well-selected cases. Advantages of the EEA include improved visualization, elimination of brain retraction, decreased manipulation of adjacent neurovascular structures, improved cosmesis and quicker recovery. However, concerns regarding the ability to manage intra-operative rupture as well as the difficulty in performing such delicate maneuvers in a long, narrow nasal corridor, a lack of familiarity with endonasal anatomy and adequate instrumentation have created hesitation among most cerebrovascular surgeons. Despite these difficulties, well-selected patients can have excellent results with this technique when applied by experienced teams. The strengths and weaknesses of utilizing the EEA for aneurysm clipping along with our indications for patient selection, surgical technique and outcomes reported in the literature to date are outlined.